Welcome to our home, part, well, two, I guess. 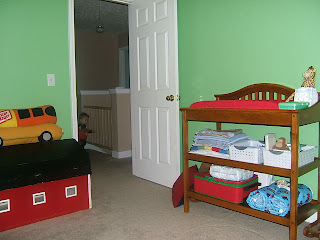 Here, Michele, are the long-awaited pictures of Seth's new room. The color on the walls is Sherwin Williams' Picnic. This is the view from the door. We get beautiful eastern sun on the back of the house, which is a great way to wake up, and perfect for afternoon snoozing. The curtains aren't actually hung yet, they're just on a tension rod for the moment. We haven't yet found Seth's curtain rod. The view from the rocker. I still want to get something to hang over the changing table. I had planned to use the lovely footprint keepsake that Sara and Doug got us for Seth's first birthday, but....um, yeah. I think that those impressions are meant to be done on newborn tootsies. I tried to get Seth's footprint, but when I rolled the clay out wide enough to get his whole foot to fit, it wasn't thick enough to get an impression that would hold. So.... hmm. Back to square one. Also, the barn to the left of the door was Jim's when he was little. We have several handmade toys, and now the toy box, too, that Jim's grandfather built for him. The thing is HUGE, but we love having it in Seth's room. I think I'm going to hang his quilt on the wall above the toy box. 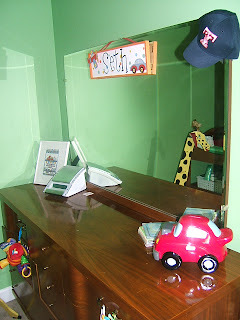 Seth's dresser. The giraffe you see reflected was also handmade and painted by Jim's grandpa. 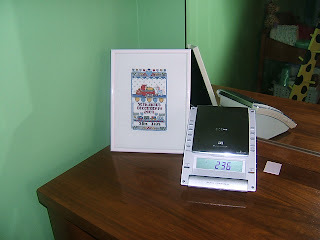 The birth sampler embroidered by my grandma and my can't-live-without-it CD player. Seth's closet. We were going to gt rid of this bookshelf, but I wrestled it into the closet, and it works beautifully. And Seth is actually getting really good about putting things away on it. I love it! 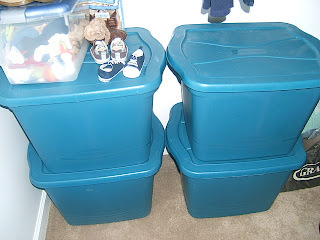 And finally...tubs full of all the clothes he's already outgrown. So sad. Oh, and one more. The occupant, charging the cameraman! I love the way you did his room. The colors are so modern and not babyish at all. Looks great! and of course Setheroni is adorable as usual! Oh, that makes me sad! I'm so sorry that the clay thing didn't work. :( I feel bad! I do love the green, though! That's a good sized room. We have the same crib...I LOVE it!!! His room is adorable and the color is perfect. Glad you are settling into your new home so well. 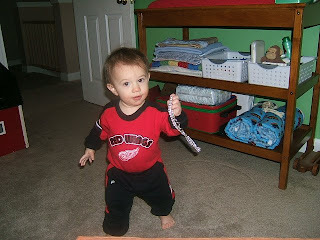 His room is so cute--but I have to say...he's even cuter! Thanks for taking us on a tour to Setheroni's picnic! 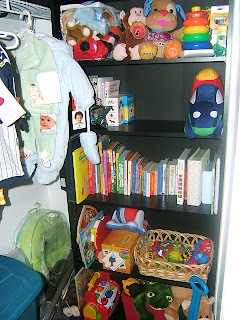 That was fun =) I love his room, it's so adorable!! And the occupant is pretty cute too. What a cheery, happy room for Mister Seth! The name sign on the mirror looks familiar. Such a cute room for such a cute boy! Thanks for the tour! What a sweet room! 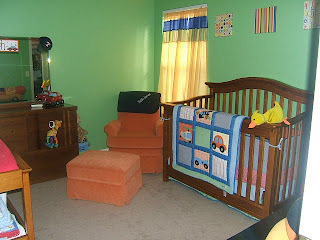 It is such a great boy room with great colors! Thank you so much for sharing and have a great weekend! Cute room. I love the bedding! 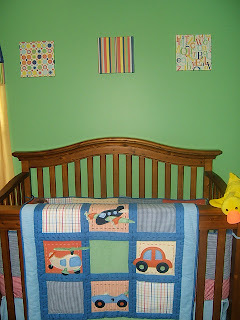 I love the quilt on the crib! I gave one similar to that one to new baby nephew.